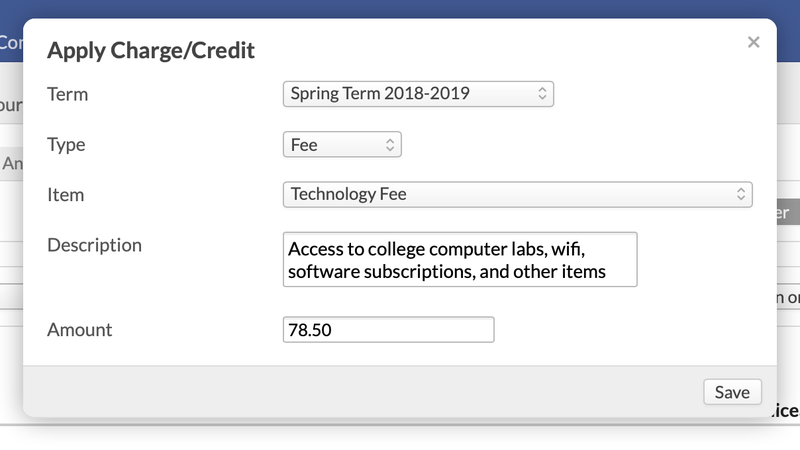 You can use the Data Slicer in Academics > Reporting to add charges/credits and add/remove/replace tuition schedules for groups of students in a given academic term. In order to use the Data Slicer and its financial functions, you'll need either the Academic Admin, Academic Auditor, or Registrar user role in addition to the Financial Admin role. Use the Data Slicer Filter tool to run a report. This will bring up the group of students for whom you wish to make billing-related updates. Keep in mind that any changes you make—new charges, changes to tuition schedules—will affect every student your find in the report! The Actions menu gives you a number of options—emailing the students, exporting, and so on. The financial functions let you Apply Charge/Credit, Apply a Payment Plan, and Manage Tuition Schedules. Have a look at this article to learn how to apply payment plans to the students returned in your report. Applying a charge or credit works much the same as it does on the student's Profile > Financial tab. Pick an academic term from the drop-down. Select the type—is this a fee, tuition charge, or for rooming or meals? Select an individual charge—for example, the Registration Fee. Enter or modify the description of the charge. Enter the amount (for a credit, simply enter a negative amount). Once you Save, the charge or credit becomes a pending item. You can view and/or invoice these on the student's Profile > Financial > By Term screen, or on the Financial > Billing > Pending Charges report. 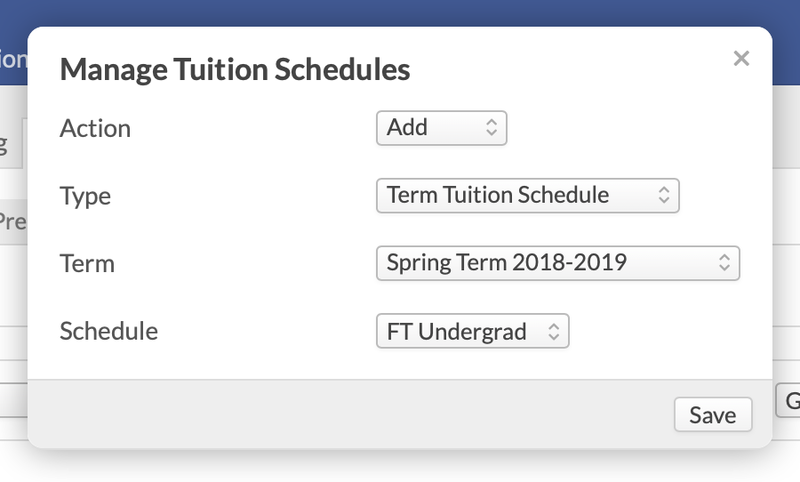 The Manage... function lets you add, remove, or replace a term or default tuition schedule for the students in your report. Select whether you wish to Add, Remove, or Replace a tuition schedule. Select if you'd like your changes to affect the Term schedule or the Default schedule. If you're changing a term schedule, select the Term you wish to change. Finally, select the schedule you'd like to change. Invoiced charges will not be affected. The changes you make using Manage... only affect pending charges or charges you'll make in the future. Add/Term: new pending tuition charges will be added to that student for any courses that are linked to that schedule; additionally, any fees triggered by a tuition schedule fee rule will also be added as pending charges. Remove/Term: any pending charges—whether tuition or fees—related to that tuition schedule will be deleted for that term. If a student in your report does not have any such pending charges, he will not be affected. Replace/Term: any pending charges related to the replaced schedule will be deleted, and new pending charges related to the new schedule will be added. Add, Remove, or Replace/Default: simply adds or removes the default tuition schedule. It does not affect any term charges. It would make sense for financial admins to be able to make mass data operations without needing access to academic data. Why not add a data slicer feature or something similar to the Financial pages rather than placing these financial functions within the Academic data slicer? Giving our finance department access to student grades and other FERPA-protected data is not a good option.